Firstly let me mention my system specs so you will know if this is going to help you should you be facing the same problem. I'm running Linux Mint 15, 64bit version, and have an Nvidia gtx 660Ti graphics card. My desktop environment is Cinnamon, version 1.8.8 but I expect it should be the same in future versions, though I haven't verified that. I just recently got myself a new, to me, 23" monitor and decided that like any true geek I'd double up my screen space by using both the new and the old monitors. Plugging them both in was no trouble at all, seeing as how my graphics card supports two outputs, but getting them to work how I wanted was a trick. That's 3200 pixels across folks. See the screen on the right kept defaulting to the primary, which wasn't what I wanted. The primary screen displays the menu bar and icons, which due to my setup simply wouldn't work, the lower portion of that screen is covered from my laptop screen, I know I have too many screens. In the past I always just used a single screen, or when using two it was on my laptop and I never left it plugged in during restarts or anything. 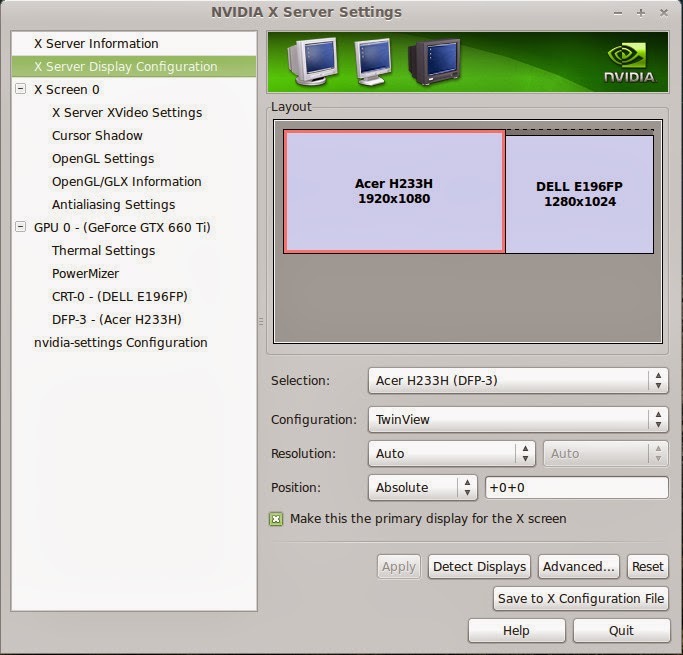 I had always configured my screens with the Nvidia software, which never gave me any trouble, and even now didn't. I could put the screens just as I wanted, but it never seemed to save for more than the current session. I saved the X Config files, but always it defaulted back to the Dell screen being primary. After a bunch of Googling, and finding nothing I decided to look around on my computer itself and I found the Display settings, under system settings. This simple looking set of options holds all power!!! okay, so that's a lie, but it does fix the problem. The screen with the little green blur around it, in this case the Acer Technologies 23" screen, is the primary, the Nvidia settings don't seem to be passed on to this, which I found slightly odd. To make the primary monitor stick all you have to do is click on the monitor you want to be primary, and click the apply button. 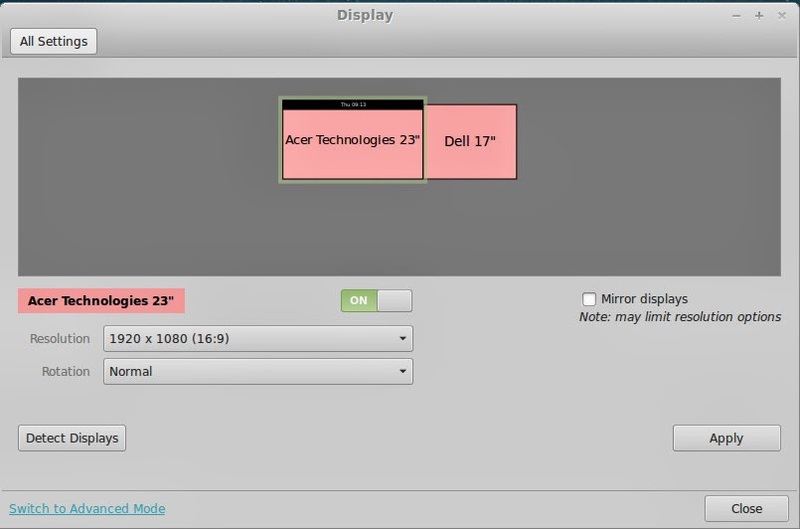 Next time you log out and in you'll find your monitors are still configured as you set them. I hope this has helped you out, and if you have any further questions don't hesitate to ask.